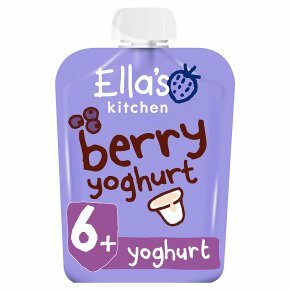 100% organic berry yummy yoghurt snack, packed full of berries, Greek style yoghurt, bananas and apples. I'm organic yummy yoghurt. Smooth + creamy. No lumps and nothing artificial. Just yummy organic fruit yoghurt. No added salt. No added sugar - I contain naturally occurring sugars.Hello, I'm an organic berry yummy yogurt, packed full of berries, greek style yoghurt, bananas + apples. Who am I made for? My pouch contains gently pasteurised smooth + creamy yoghurt. I'm suitable for babies and toddlers from 6 months. The Government advises that food containing dairy products should only be introduced into a babies diet after 6 months.